1) Hyprocell Fully Human Monoclonal Antibody Development technology is using a Karyochi-based fusion partner to produce fully human antibodies for treatment of cancers and other diseases. 2) The antibodies secreted are full size immunoglobulins with naturally assembled heavy and light chains with both antigen dinding and effector domains. 3) No mouse or Phage display or Yeast involved. Beginning to end, our technology uses human cells to produce fully human monoclonal antibodies. 4) We can develop diagnostic tests using said antibodies. 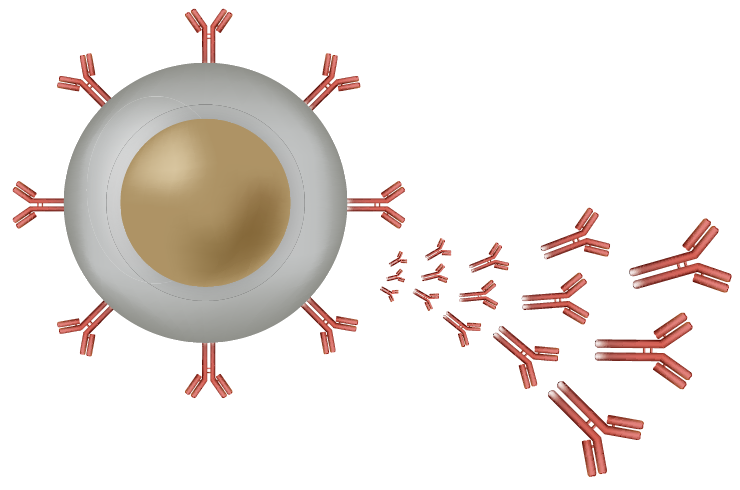 5) Our Fully Human Monoclonal Antibody Technology is very cost effective. 6) Hyprocell’s technology does not involve time-consuming or expensive humanization steps. 7) We can also produce vaccines. stable antibody or protein cell lines in approximately 4 months. 2) Hyprocell’s cell lines are fast growers (doubling time ~24 hours). 3) Reach high cell density (6-7 million cells per mL) in shake flasks. 4) Maintain high viability (> 95%). 5) High volumetric (up to 3.0gm/L) and specific productivity (50 to 100 pcd) in shake flasks. 6) The Antibody cell lines might produce up to 6.0 g/L antibody in stirred tank bioreactors. 7) These cell lines are stable for 90 to 120 generations and can easily withstand up to 2000 Liter culture without any selection pressure. Hyprocell is a one Stop Shop Company to develop both Fully Human Monoclonal Antibody and High Producing Stable Antibody or Protein Cell Line that can go to drug manufacturing. speed of 70,000 events per second. Copyright © 2019 Hyprocell. Powered by Webbersaur.us.